Another edition of Trouble from Sub.Media. This time setting it’s sights on Gentrification, something that is becoming more of an issue in cities across Europe and beyond. Edinburgh has seen a rash of Gentrification for years as more poorer people are priced out of the city centre and pushed further from the neighbourhoods they grew up in. In cities across the world, established urban environments are being transformed according to the dictates of capital. Gentrification is destroying the social fabric of working-class and racialized districts, displacing long-standing residents in order to make way for a new class of upwardly-mobile, and often white professionals – who often view the rich local histories of the spaces they move into as nothing more than kitschy branding appeal. The culture clash that emerges between established community members and these new arrivals is often viewed as the front-line of struggles around gentrification; a quarrel between patrons of a locally-owned roti shop, and those of a new craft beer pub; or a battle between NIMBY condo-dwellers and the beneficiaries of a local social service agency. But while this tension is certainly real, it is only the tip of the iceberg. 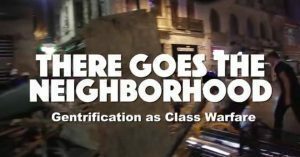 Gentrification is a systematic process, facilitated by state, regional and local governments and bankrolled by massive financial institutions managing multi-billion dollar portfolios. It is class war playing out in physical space, with all the complexities and contradictions that entails. We plan to start the screening at 7.30 and will have time for discussion of the film afterwards. We will abide by the safer spaces policy of the Autonomous Centre and consequently will not tolerate sexism, racism, homophobia, transphobia, ableism, or any other form of oppression. Participants will be expected to abide by this agreement as well. The safer spaces policy can be found here. Hope to see you and your comrades there!